As described before, synthetic biology captures a diverse, multi-disciplinary field. No matter which definition(s) becomes accepted, the ability to make and manipulate DNA is a vital component to practicing synthetic biology. A large number of parts have been made by the synthetic biology community. Many can be found as part of the Registry of Standard Biological Parts. These modular genetic components are designed to be easy to acquire and assemble to facilitate the building of more complex biological devices. To learn more about the Registry and the biological parts known as BioBricks™, see the entry for the iGEM Registry. Oligonucleotides, short single-stranded DNA pieces, are chemically synthesized from DNA phosphoramidite monomers. Briefly, activated phosphoramidite monomers are added in the 3' to 5' direction using a cycle of activation and blocking chemistry to obtain a DNA polymer linked by phosphodiester bonds. Chemical synthesis is currently limited to oligonucleotides of about 200 nt in length. It is used often by synthetic biologists to make primers for PCR or gibson assembly (described later). Gene synthesis, or artificial gene synthesis, refers to the process of creating a nucleic acid template for a gene in vitro, without the requirement of a preexisting DNA template. It predates the invention of restriction enzymes and molecular cloning techniques by several years. The first gene to be completely synthesized in vitro was a 77-nt alanine transfer RNA by the laboratory of Har Gobind Khorana in 1972 . This was the result of nearly five years of work and resulted in a DNA template without promoter or transcriptional control sequences. The first peptide- and protein-producing synthetic genes were created in 1977 and 1979, respectively [2, 3]. Chemical synthesis of DNA has grown from an expensive and time-consuming process into a viable commercial industry capable of versatile and high-throughput manufacturing. DNA can now be made to order for species-specific gene optimization, creation of genes from rare or dangerous sources, and combinatorial assembly of any DNA sequence that can be chemically synthesized, including non-natural bases. Despite nearly four decades of progress in gene synthesis technologies, most DNA sequences used in modern molecular biology are assembled in part or in whole from naturally occurring templates. However this limits the scope and applications to previously existing genes and the results of large-scale genomic surveys of novel genes from nature. Modern gene synthesis relies heavily on advancements in chemical DNA oligonucleotide synthesis, with the primary challenges being scale, cost, fidelity and the eventual assembly of complete gene products. An extensive, but not comprehensive, directory of commercial gene synthesis providers can be found at Genespace. Gene synthesis is one of the key enabling technologies of synthetic biology. The increase in efficiency and the decrease in cost is occurring at a staggering rate. 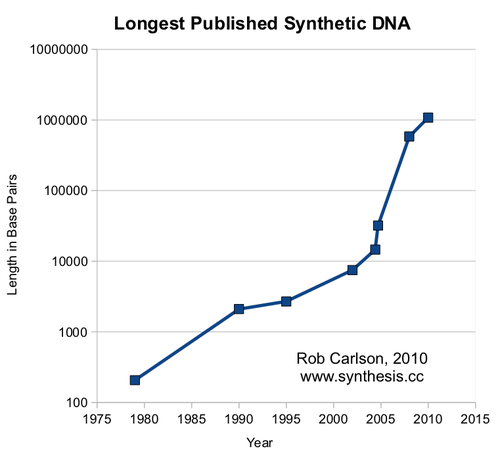 Below is a graph comparing DNA synthesis to Moore's Law. In addition, it includes another enabling technology, DNA sequencing. 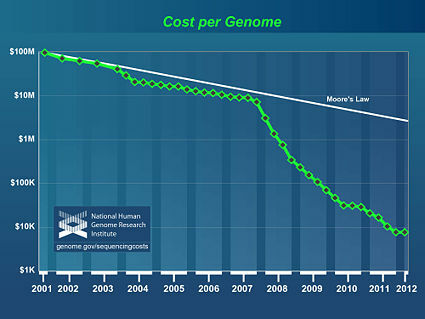 The bottom right graph shows that genome synthesis is technically feasible ; however, it is not yet a commercial service. 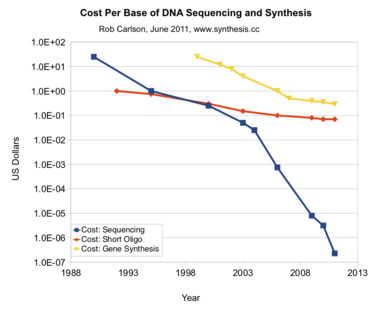 Cost per Base of DNA Sequencing and Synthesis. It is impractical for most synthetic biologists to synthesize more than several kilobases of completely synthetic DNA. It is often desirable to build bigger pieces at lower costs and faster speeds than de novo synthesis is currently able to accomplish. Over the years, many different strategies have been developed to assemble DNA in flexible ways that suit different purposes. These strategies typically employ purification of enzymes that are known to modify DNA in specific ways and these methods of action can be exploited for designing and building specific sequences of DNA. For example, restriction enzymes are used to cut DNA in a specific manner upon recognition of a specific nucleotide sequence. Polymerases and endonucleases add or remove nucleotides to make double stranded DNA from a single stranded template or to create single stranded DNA from double stranded DNA. Many of the modern techniques take advantage of recombination machinery that move DNA from one location to another location. In other cases, the endogenous enzymes in a host are utilized to manipulate DNA without the need for prior purification. For example, in some methods endogenous DNA ligase is used to repair single stranded breaks (known as "nicks") to complete the formation of fully circular DNA. Ultimately, these methods generally require transformation into a host where endogenous enzymes are used to complete the genetic manipulation and replicate (clone) the genetic material. This allows for the expression of the desired proteins to test the ability of the engineered system or for the purification of the genetic material itself such that it can be used for further manipulation, study, or storage. While there are many specific protocols for the numerous methods of cloning, most share reasonable overlap in their underlying mechanisms of action. Broadly speaking, methods may rely primarily on restriction enzymes, polymerase chain reaction (PCR), or on homologous recombination [5, 6]. Restriction enzymes recognize a specific nucleotide sequence and then cut the DNA in such a way that results in a double stranded break. If the enzyme cuts within or near the recognition site, it is classified as a Type II restriction enzyme. 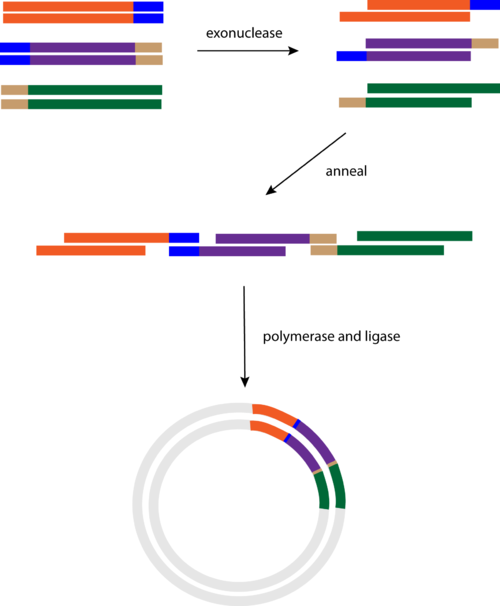 When a restriction enzyme cuts a piece of DNA, the ends can be straight resulting in a blunt end or with a jagged cut resulting in a sticky end. One modification to the standard restriction enzyme method is the use of an enzyme that recognizes a non-palindromic sequence. This results in the ability to cut with a single restriction enzyme and still maintain directionality of the biological part. Other methods have been developed that utilize Type IIs restriction enzymes. These enzymes cut away from their recognition site. This strategy has the advantage over Type II enzymes in their reduction of a "scar" sequence and ability to generate combinatorial libraries. , which utilizes the propert of Taq polymerase to leave a single A nucleotide overhang after the PCR reaction. In combination with an optimized vector with a T nucleotide overhang and a topoisomerase that recognizes the vector at the T overhang position, the insert and vector that are annealed at the T and A nucleotides are sealed into a circular vector efficiently. Oligonucleotide precursors are linked together leaving gaps that must be filled in by DNA polymerase. In the most common method, polymerase cycling assembly (PCA) , DNA oligonucleotides are designed to be part of either the top or bottom of the final DNA duplex. Cycles of annealing and polymerase extension result in a growing DNA duplex built from smaller oligonucleotide fragments. A final round of PCR is done with constant primers that amplify the complete desired gene product. Initial oligo linkage is done for 20-30 cycles and full-length PCR is carried out for 20-30 additional cycles. In 2009, Daniel Gibson of J. Craig Venter's group reported a method for assembling hundreds of kilobases of DNA sequence using an isothermal enzymatic setup known today as "Gibson Assembly" . Sub-fragments of the eventual assembly product are obtained as blunt-ended double-stranded DNA molecules several kilobases in length. They share several hundred bases of homology at their adjacent termini. T5 DNA Exonuclease chews back the double-stranded DNA molecule to reveal 3' single-stranded overhangs. Being heat-liable, T5 exonuclease is inactivated after several minutes at the reaction temperature. A mixture of thermostable ligase (Taq) and DNA polymerase (commonly Phusion) repair and assemble the individual fragments into larger molecules. This method has been used to assemble nonfunctional DNA molecules up to 900 kilobases in length, as well as the complete 16.3 kilobase mouse mitochondrial genome . The size limit of molecules that can be assembled in this manner is currently limited to the cost of design and screening the final assembly products and the hundreds of kilobases of DNA that must be sequenced. An illustrative video of this process can be found on the NEB website. Of all the cloning techniques listed on this page, "Gibson" cloning is becoming one of the most dominant cloning strategies in synthetic biology labs. Its fast, flexible, relatively simple design has made it a favorite among synthetic biologists. Schematic Drawing of the "Gibson" cloning method. Note that this can be done on multiple DNA fragments and in "one pot" at a constant temperature (50° C). The methods below are not new methods and some are already being used commercially. What they offer for the future are methods for potentially scaling up production while decreasing costs. As mentioned before, cost and speed are major limitations preventing de novo DNA synthesis from becoming standard practice. An alternative gene synthesis technique using solid-phase synthesis of a DNA duplex has been created by several companies, including Blue Heron. In these methods, DNA oligonucleotides are synthesized as in other techniques, they are annealed into complementary short duplexes without overhanging ends, and these duplexes are chemically ligated on a solid phase such as a liquid chromatography column. The complete synthetic DNA duplex is then eluted and used for downstream processes, such as cloning or gene expression. DNA oligonucleotides have become a commodity and the price per base has been steadily dropping. But there is still great expense involved in large-scale gene synthesis. For a several kilobase gene fragment, oligo cost alone can still exceed $1,000. To over come this hurdle, multiplex parallel gene synthesis technologies are under development, including inkjet DNA printers, photolithography and electrochemical parallel synthesis. Microfluidic microchips are a common multiplexing solution. In the method of Tian et al. , oligonucleotides are synthesized while coupled to a microchip at their 3' end. The overall process is similar to traditional oligo synthesis, except that individual wells are photoactivated before addition of the next base onto the 5' end. After chemical cleavage of the complete oligo from the microchip, they are hybridized and purified using complementary "quality assurance" oligos bound to magnetic beads. This method eliminates oligos that have either incorporated extra bases or undergone deletions. Final yield from each synthesis well is only around 5 fmol of oligo, which is not sufficient for downstream applications. 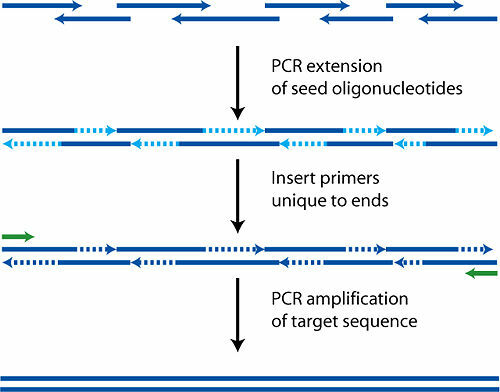 A final amplification step using common PCR primers to all oligos increases yields up to a million-fold. Oligos can then be assembled by overlap PCR-based methods such as polymerase assembly multiplexing, or PAM. This method has resulted in the synthesis, amplification and expression of a 14.5 kb, 21-gene 30S ribosomal protein operon from E. coli. One major roadblock remaining in synthetic gene synthesis is overcoming natural error rates in DNA synthesis chemistry. Phosphoramidite oligo synthesis currently has an error rate of 1 in ~160. This results in a high enough error rate in assembled genes that screening and sequencing are major cost bottlenecks, as is the repair or re-synthesis of mutated genes. While the development of cheap and high-throughput sequencing technologies will streamline the screening process, oligo synthesis error rates must also be reduced. Currently, oligo pools are often screened against complementary reference libraries that can be reused. Oligos that do not completely base-pair with their designed sequence are either washed away in purification steps or are cleaved by DNA mismatch repair proteins due to their imperfect base-pairing. This has currently decreased error rates to 1 in 106, on the order of error rates in DNA polymerases. J. Craig Venter's team at JCVI carried out the largest gene synthesis currently reported through the creation of a completely synthetic genome. Initially, the JCVI team synthesized a 582,970-base pair "minimized" genome of Mycoplasma genitalium using a stepwise assembly . The genome was divided into 24 cassettes of about 24 kb each which were synthesized by commercial manufacturers. These overlapping cassettes were enzymatically stitched together into bacterial artificial chromosomes, which were attached in a stepwise fashion using a combination of restriction digestion and in vitro recombination. At the point where the molecules were "quarter genomes", they were transformed into yeast where in vivo recombination machinery assembled the full M. genitalium chromosome. This was only proof of synthesis, however, and not of a synthetic genome useful for supporting a living organism. In 2010, the JCVI team reported the creation of a bacterium controlled by a fully synthetic genome . The 1.08 mega-base pair genome of Mycoplasma mycoides was synthesized and transplanted into a M. capricolum recipient cell to create a synthetic bacterium nicknamed "Synthia". The genome was divided into 1,078 1-kb cassettes, which were synthesized by Blue Heron. These cassettes were assembled in yeast using in vivo homologous recombination using a three-step hierarchy that built fragments of ~10,000 bp, ~100,000 bp and finally the complete 1.08 mega-bp genome. These were then isolated carefully from contaminating yeast DNA and transplanted into the recipient bacteria. A selectable marker placed in the synthetic genome demonstrated that bacteria that grew after transplantation were controlled by the synthetic genome. The same team demonstrated that a semi-synthetic genome could be assembled and transplanted using a combination of natural and synthetic DNA. Final assembly of large double-stranded DNA products into kilobase and megabase functional molecules, free of errors and with minimal cost remains a process bottleneck for gene and genome synthesis. In vitro recombination methods have been successfully used to assemble large DNA molecules on the order of tens of kilobases, but this method remains prone to errors and requires considerable homology be engineered into assembly fragments. This page was last edited on 3 May 2013, at 00:06.